The first product to be snapped up was Silent Treatment a trio I like to think of as girly-with-an-edge. The brow bone colour is a delicate champagne pink, beautiful anywhere in particular the inner corner or middle of the lid. The eyelid colour is one of those beautiful shimmering taupe that we all know and love. 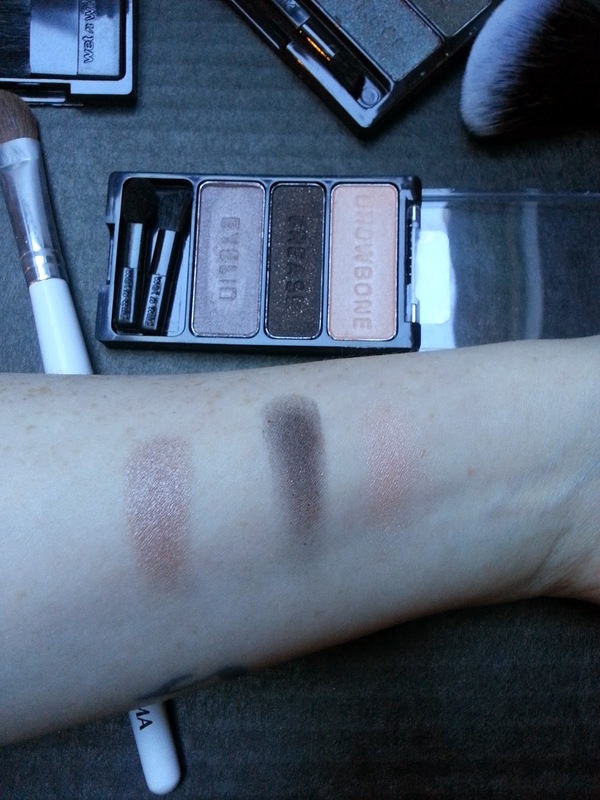 Yes I have a bizillion taupe shadows, but you can't have too much of a good thing right?! The crease colour is a rich black with gold, almost antique gold, glitter. I have a feeling you'd really need to pack on the colour to get the glitter to show, but I'm very impressed with the pay-off having been disappointed on many occassions with "black"(read: grey) budget eyeshadows. I could happily use the little trio day after day and never tire of how lovely it is. The blush selection was modest to say the least, but there was a part of me that wanted all of them. Mellow Wine won me over as it was just too pretty to pass up. It's a soft plum-y pink which reminds me of vibrant pinks coming our way this season. Also it's matt which I love. There's something so pretty about it. I'm not a fan of Barbie-pink blushes, this is about as pink as my blush collection gets - but I'm very happy with that. Finally, and I'm sure many of you recognise this - Comfort Zone. This 8 pan wonder has been a cult hit for years so I couldn't resist it when I saw it sitting there, in front of me, in all it's €6.49 glory. That's less than a euro per shadow! Sure I'de be mad not to. There are so many wearable colours in this pallet - pretty much the entire left side for me, and others that aren't too mad that you wouldn't be tempted to try them out. The colour on the bottom right is very interesting (and difficult to photograph) it's a rich chocolatey brown with something like an oil-slick-colour glitter. Bluey-black. I have yet to try it out but to say I'm intrigued is an understatement. Don't know how much use I'll get of the greens, although the darker, emerald green, looks like it would be a great feature colour for a smokey eye. My verdict? BUY EVERYTHING. Well, considering this entire shopping trip cost all of €15.47, I'll probably be the one buying everything. To be honest I'm itching to get back to my nearest Dunnes Stores and pick up another few (many) bits. 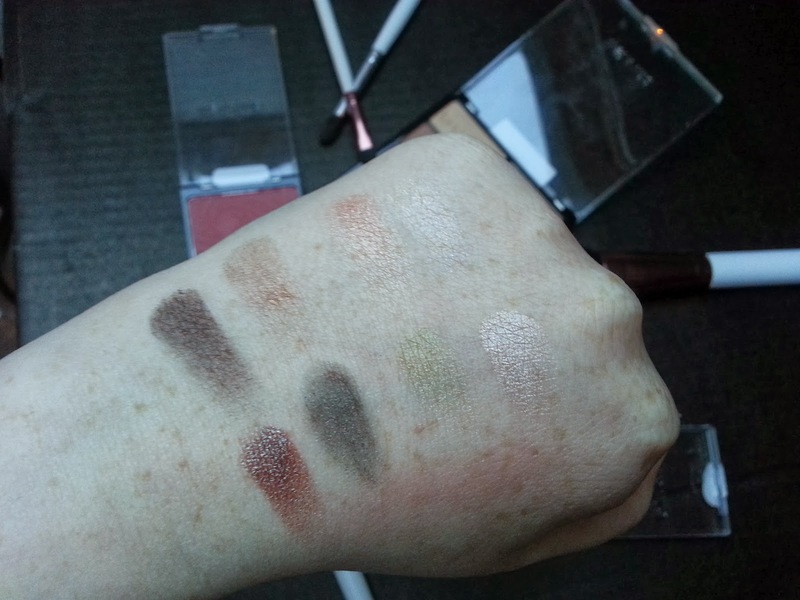 In particular the Walking on Eggshells, which Orla featured on her blog (MakeupOverMind) because we all need more beautiful browns in our lives. Have you tried out any Wet n Wild yet? Are you even a little bit tempted?